Nobody really knows what plant roots are doing when they're at home. Digging up a plant exposes the roots, but destroys the soil's natural fabric. Information is lost about the intact natural arrangement of the roots and soil. Ditto for studying the roots of plants in pots. In fact, there is no noninvasive field method of determining, in detail, how the root systems of crop plants change over time in response to variations in weather or soil nutrients. That's why the federal government has begun an ambitious program to reveal the secret lives of roots that includes using magnetic resonance imaging (MRI) of living plants in the field. NIST scientists Karl Stupic and Joshua Biller are playing a key role, supported by the Advanced Research Projects Agency-Energy (ARPA-E) under a program called ROOTS, for Rhizosphere Observations Optimizing Terrestrial Sequestration. The project, Magnetic Resonance Imaging for Root Growth is led by Texas A&M University with partners at the Athinoula A. Martinos Center for Biomedical Imaging in Boston, Massachusetts, and ABQMR, Inc., an Albuquerque, New Mexico, research and development firm specializing in magnetic resonance technologies. "Nearly everything we know about plants is from the ground up," said Stupic. "Our goal is to provide an image of roots in an intact soil column, using MRI with a very low magnetic field, less than 100 millitesla," or 0.1 tesla. The tesla is the unit of magnetic field strength in the SI, the international system of units. "We want to find out how living roots in the ground interact with the surrounding soil," said Biller. "Root images are vital to understanding how crop breeding affects root structure, as well as understanding the function of soil attributes such as organic carbon content, and determining the tolerance of a species to drought, wind, flood and disease." The issue is particularly urgent because soil quality and levels of topsoil have declined over the past century, even as modern agriculture is increasing productivity. According to ARPA-E's program statement, "If successful, developments made under the ROOTS program will produce crops that will greatly increase carbon uptake in soil, helping to remove carbon dioxide (CO2) from the atmosphere, decrease nitrous oxide (N2O) emissions, and improve agricultural productivity." There are several more conventional methods of looking in on roots. Some research utilizes glass-windowed underground tunnels or transparent containers called rhizotrons. One disadvantage of such methods is that the glass area provides a preferential route for water flow, potentially distorting root formation. Ground-penetrating radar (GPR) has also been used to detect the root structure. Higher microwave frequencies produce higher resolution, but they can't penetrate as deeply. "The full root structure of crops such as sorghum, which is the focus of this study, may extend up to 1 meter below the ground based on preliminary core samples from our collaborators at Texas A&M. Low-field MRI is a first step in investigating the entire root structure," said Biller. In MRI, an object is exposed to a magnetic field while it is scanned with radio-frequency (RF) excitation. For the ROOTS program, the plan is to deploy a small MRI system– initially 10 inches in diameter, but eventually larger–to encircle the plant's major root mass and record changes over time. The initial imaging volume will capture root structures down to 18 inches below the surface of the ground. 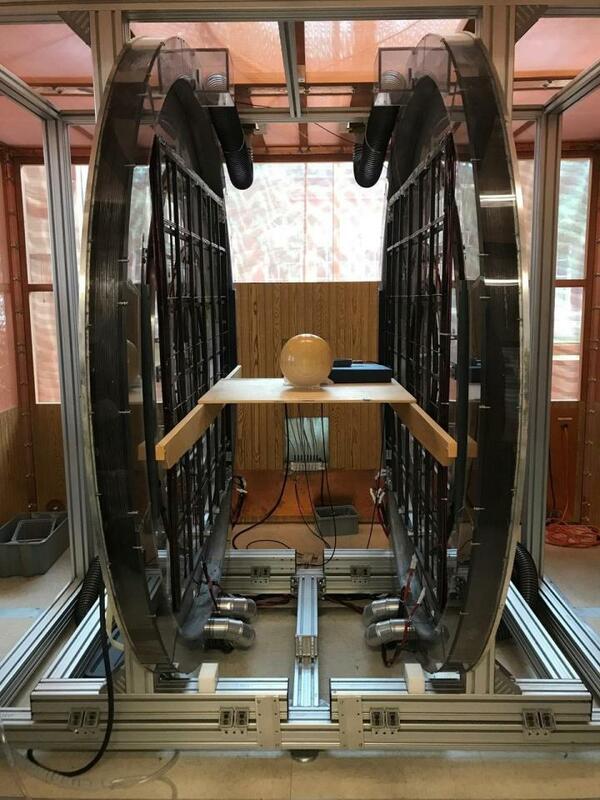 To that end, the NIST team is constructing a low-field scanner in one of its Boulder, Colorado, laboratories. It will be an open design–about 1.8 meters (6 feet) long, 1 meter (3 feet) wide, and 2.1 meters (7 feet) high–based on a system now in use at the Martinos Center for Biomedical Imaging. The center's director, Matthew Rosen, has extensive expertise in using low-field (6.5 millitesla) MRI for human imaging. Stupic and colleagues will use the new device to find the best ways to image roots, and to provide standard reference samples and phantoms–synthetic objects that accurately mimic plant material in the scanner. That will ensure comparability of data and validate the results that will soon be coming in from Texas A&M's field studies using in-ground scanners developed by ABQMR, Inc.
"We're going to develop baseline reference data, design calibration objects, and come up with realistic 3D plant phantoms," Stupic said. The project scanning system is expected to be fully functional during the summer of 2018. "ARPA-E's initial target is to image 10,000 plants in one growing season of between five and seven months," Stupic said. "That means we've got to scan about 50 plants a day. "Because part of our mission is to get the technology out and used in the field, we will also get involved in looking at ways to shrink the electronics and associated hardware. We'll need something that you can bring in on a small truck, maybe using an ATV to run alongside the plants and take data. And we need to do all of this in a matter of a few months." NIST will provide periodic news updates as the project progresses.